Last summer, Antonio Diaz Chacón did something dangerous and risky because he didn’t really see any other choice. He heard a neighbor shouting that a little girl had just been abducted, so he jumped in his truck and gave chase. At first the driver of the van didn’t seem to know he was being followed. But then the van began to speed up and to veer this way and that before sliding off the road and crashing into a pole on the outskirts of Albuquerque. The driver ran, stashing a roll of tape and some straps under a rock. Chacón hopped out of his truck and grabbed the girl. She was confused and scared, but he told her that everything was going to be all right, that he would take her home, and that’s exactly what he did. Four years ago, Chacón did something else dangerous and risky because he didn’t really see any other choice. He left his impoverished home in Chihuahua, Mexico, and snuck across the border near Santa Teresa. Married now, with steady work as a mechanic, he still doesn’t have his immigration papers. Which means that Antonio Diaz Chacón is both a great American and not an American at all. Christine Marty and her mother had just gone back-to-school shopping in Pittsburgh. She bought a dark-gray pair of BDG jeans, a Sparkle & Fade sweater, and some tank tops she could wear to both dance and accounting class. On the way back home, they could barely see the road. The Lexus RX 300’s defogger was broken, so Marty had to wipe the windshield down with a rag — then, gridlock. Pouring rain. Flooding. The water rose and soon began to fill up inside the car and to submerge their laps. And then the car itself was floating, like a bumper car, crashing into the other bumper cars along the street. By the time they got out — Marty through the window, her mother through the sunroof — they could hear the screaming of Romy Connolly, sixty-nine years old and suffering from lung cancer. Marty swam over and pulled Connolly out the window. With Connolly tucked under her left arm, she fought the current with her right. But Connolly had all but given up. She didn’t want to hold on anymore, she just wanted to let go. Then the praying started. Marty began reciting the Our Father, and Connolly mouthed the words. Everything was going to be okay. And soon it was. On my way to the neighbors’ house yesterday, thinking of myself as a chicken farmer, a rhyme arose spontaneously in my head: Boggis and Bunce and Bean/One fat, one short, one lean/These horrible crooks/So different in looks/Were nonetheless equally mean. 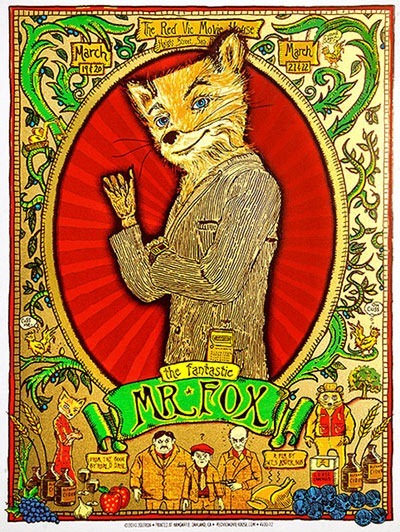 This, of course, is limerick from Roald Dahl’s Fantastic Mr. Fox, which happens not only to be my favorite childhood book, but also the book I used while tutoring the neighbors’ youngest son in reading. He and I both knew the story well, and loved the descriptions of the three farmers scheming to kill Mr. Fox. There’s Boggis, the fat chicken and duck farmer; Bunce, the pot-bellied dwarf who only eats donuts filled with goose liver paste; and Bean, the turkey farmer who is thin as a whip from ingesting nothing beyond apple cider. These three unmarried and unhappy farmers are excellent villains, yet one can’t help feeling a little bad for them. Their only purpose in life is to raise poultry, and they are bedeviled in this by the thieving Mr. Fox. I can only imagine how upset I would be if some of my neighbors’ chickens were murdered on my watch by a cunning predator. Of course, Mr. Fox is only trying to provide for his young family and is remarkably charming (even for a fox). Still, the final scene in which the three farmers sit outside the fox hole in the rain, waiting endlessly for the fox family to emerge, is utterly pathetic. Perhaps they should consider starting CSAs instead–Mr. Fox wouldn’t be at all interested in the produce and the farmers would probably see an improvement in their outlook on life with a change in diet. After all, donuts filled with goose-liver paste are bound to put anyone in a perpetually bad mood. It’s going to be a sad Thanksgiving. I read today in Minneapolis’s newspaper, The Star Tribune, that the recent heat wave boiling over the United States has led to the deaths of over 100,000 turkeys in Minnesota alone. Luckily, my neighbors’ chickens that I’ve been caring for this week have all survived. Unfortunately, I can’t say the same for some of the vegetables left out on my neighbors’ porch by their CSA. CSAs, farms that supply Community Supported Agriculture, are all the rage here in the Twin Cities, where we are both surrounded by farmland yet separated from it by snaking highways and suburban developments. With membership in a CSA, you are guaranteed local produce on a weekly basis that evolves with the season and is delivered by the farmers who grew it. My neighbors’ house is a drop site for a local CSA, and I was pleased to see that one of the subscribing families hadn’t picked up their box yesterday, which meant the veggies were free for the taking. I dragged the heavy box home. I unpacked luscious green Swiss chard, hearty cucumbers and zucchinis, and brilliant purple onions. Then things took a turn for the worse. Underneath these lovely vegetables was a giant head of cauliflower that should’ve been white but was quickly turning brown and slimy from being left all day in the heat. Fennel fronds just below had wilted to inedibility. A bag of green beans at the bottom of the box had started to sprout fuzz. It’s terrible to waste food, but even more difficult to throw out produce grown on a nearby farm by a man whose face you recognize. It feels sacrilegious, even. 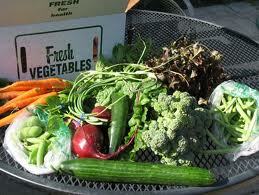 Yet there was nothing else to be done–onto the compost heap this food went. The heat wave will have many negative consequences for people across the country, and especially for the farmers among us. Thus, it feels all the more important to support small farms as much as possible, and CSAs are the most delicious way to do it. It may be too late in the season to sign up, but see if you can find a farm near you for next year! A year and a half ago, on my birthday, I went to a program called “Wits.” The featured guest was Susan Orlean and the topic was chickens. The hosts seemed to assume that chickens are such an inherently funny topic, they wouldn’t need to prepare much. Luckily, Orlean had plenty to say on the subject. 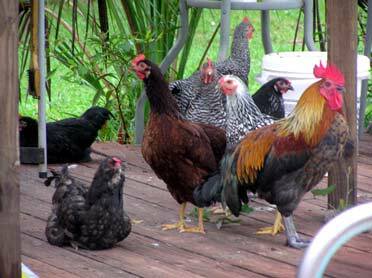 Orlean published an article in The New Yorker two years ago called, “The It Bird,” which details the recent exponential increase of urban chicken owners. As Orlean notes, chicken-owning was quite common until the 1950s, since the animals are so hardy, easy to care for, and productive (a hen in her laying years provides an egg every 1-2 days). Yet, in the 1950s, everyone wanted to be modern and anything hinting of agriculture was antithetical to modernity. And now everyone wants chickens again. The word locavore became popular in 2007, along with its way of life: eating food that comes from a 100-mile radius from where you live. Many people interpret this by growing their own small garden of fruits, vegetables, and herbs, but what better way to complete the meal with eggs from your backyard? My neighbors were on the cutting edge of the chicken-trend, and built a decidedly elegant coop and run several years ago when remodeling their garage. Fifteen chickens now call this coop home. I was anxious about providing daily care for the hens while my neighbors are on vacation, but I find myself already enjoying the domesticity of collecting eggs, putting out feed, and shooing the girls inside at night. It’s probably a long leap from taking care of a few pretty hens to the harsh realities of the farming life, but maybe I wouldn’t be so bad at it after all. I also viewed my dog-sitting episodes as trial periods to see if I was ready to once again have a dog of my own. I took care of several different breeds and sizes of dogs, but even though I enjoyed being with all the them I always came to the same conclusion: there will just never be another dog like my Max. 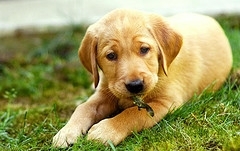 My family got Max, a yellow lab-goldenretriever mix, when I was four years old. I was obsessed with The Little Mermaid at the time, and thus thought Max was the only acceptable name for a dog (just like Prince Eric’s dog). My brother agreed, but my mother protested. We had gotten a girl dog, after all. Our solution to naming our little puppy was to each write two potential monikers on slips of paper, then dump them on the floor. Whichever slip of paper our puppy began to eat first would become her name. Conceding somewhat to my mom’s pleas that we should write girl names on the papers, I wrote Maxine on one and Emerald on the other. (My dad, however, ignored my mom’s gender-specific request and wrote down Noam Chompsky and Labrador Dali). We put the eight names in a hat, and dumped them on the floor. The first slip of paper we pried loose from our puppy’s mouth, covered with slobber and slightly shredded, said, in my four-year-old’s handwriting, Maxine. My mom rolled her eyes, but then said excitedly, Every dog needs a middle name! Let’s have her choose again. Max needed no incentive to start chewing on more paper, and we pulled another slip from her mouth. This one said…Maxine. It was my brother’s handwriting. And so our dog became Maxine Maxine. (When my mom registered Max at our local vet, though, she conveniently forgot Max’s middle name and gave Max her own last name). While Max sometimes ran away, ate garbage, had accidents in the living room, and rolled in dead fish, she was also the sweetest creature in the world. She lived until just after I went away for my freshman year of college, thereby accompanying the entirety of my conscious childhood. Though she died seven years ago I still feel her absence acutely. I don’t think I’m ready for a new dog. I saw this posted on a friend’s facebook page a few weeks ago and re-posted; a week later it seemed everyone had posted it. I guess that’s the nature of adorable, funny, short youtube videos–they spread like fleas.